Setup Creator - MSI to EXE is professionally designed to create Executable .exe file package from Windows installer .msi setup package. Setup builder tool for MSI to EXE file easily converts whole .Net frameworks installer file into Executable file while maintaining same functionality of existing setup file. Award winning exe setup creator wizard is fast and flexible application program creates .exe file from .msi file package in just a single click and provides option to save converted exe file at safe location on the computer system hard disk drive. Easy to access setup maker utility is easily understandable by all users and does not require any special skill to operate it. Provide facility to convert Microsoft Visual Studio.NET framework MSI installation setup packages to equivalent and similar exe installer format without compromising the originality of your MSI package. Easy wizard like easy interface facility to convert MSI in EXE format just by one click. Original .MSI file format, functionality and structure of your application remains unchanged. 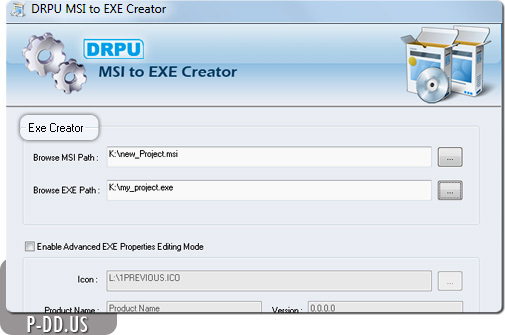 Easy and user friendly single click MSI to EXE setup creator program and do not require any prior technical knowledge. No special skill is required to operate the setup maker tool.